"Yokai Watch? WTF is that?" was my first response when I heard about the 3DS game that had Brian ransacking toy stores. 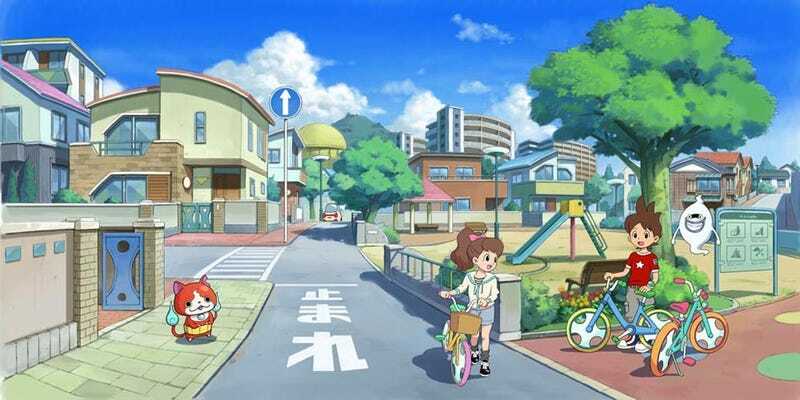 Yokai Watch (妖怪ウォッチ) is pretty much a Pokemon style game from Level-5 of Professor Layton fame, where the objective is to collect cute little fairy-like monsters – called Yokai – to battle with. The game came out last year completely under my radar, but with the anime going strong, and the game itself hitting the million sales mark recently, I had to see what the hubbub is all about. In the game, you play the part of a young boy or girl who rescues the ghost, Whisper. In return, you are granted the Yokai Watch, a device that allows you to detect and see the invisible yokai that populate the world. By finding and beating the various yokai, you can befriend them and they will give you a "yokai coin" that allows you to summon them to your aid at any time. Together with your newfound buddies, you set about helping people in need and stopping the wrongdoings of mischievous yokai. It's kind of difficult to play the game without making comparisons to Pokemon, but the core concept is the only real overlap. The game takes place very much in the real world and while yokai are everywhere, they're not ingrained in society. The game's story plays out in chapters, and while more areas become accessible over time, you never really leave your home town. Unlike Pokemon the game does not have a specific goal set from the start like becoming a Yokai Master or something. It's just the adventures of a child who discovers a fantastic and wonderful world that hides in plain sight. The actual Yokai Watch is probably the most entertaining element of the game. When you are running about, a meter will rise or fall depending on your proximity with a hidden yokai. Once you're close enough, an exclamation point will appear above your character's head and you can look for the yokai close up. You can move the "yokai lens" about the screen to find the invisible yokai, but the buggers move around and even if you spot one, you have to stay locked on to it in order to fill a meter. When they realize you've spotted them, the yokai will scamper about, trying to stay out of your sight, forcing you to follow them with the lens. Once the meter is filled, the yokai will appear and a battle will ensue. You can have up to 6 yokai in your active roster. 3 will serve as the front and actually fight simultaneously while the other 3 remain in the reserves. You can rotate the yokai at any time to move the battle to your advantage or to keep wounded yokai out of harm's way. Battle itself is semi-automatic. Yokai will attack or defend or even slack off on their own. The player can assist by using items, specifying targets, having yokai execute special moves, or healing yokai that have been possessed. Each yokai has a special move that the player can order them to perform. But having the yokai actually pull off the move requires you to do a series of simple touch panel acrobatics by tracing a series of patterns, spinning a wheel, or tapping spheres of light that move across the screen. There are a plethora of yokai to befriend throughout the game – all in all well over 200. And once you start finding and collecting them, then comes the urge to "catch 'em all." There are several other characters you run into in the game, but the main focus is definitely the yokai, and this is where Yokai Watch is probably going to have the biggest hurdle in becoming the next Pokemon: Yokai Watch is very Japanese. That's not a racist jab or anything. Just that a lot of it is going to be very hard to translate. Most of the yokai that appear in the game are based on Japanese lore and I'd say a good 70% or more have names that are puns or a play on words that are a translator's nightmare. For example, the yokai Negatibuun's name is a combination of the word "negative" and "buun," the onomatopoeia of a mosquito flying. The yokai itself looks like a mosquito wearing a hoodie which is funny if you understand the joke, but otherwise it's going to just pass you by. Perhaps they could translate it into something like "Negatisquito" but then I feel something will get lost in translation. Yokai Watch is full of such word games. Even the word "Yokai" is a challenge. Are they "monsters?" No. Are they "fairies?" Not exactly... They're just "Yokai." This is the kind of thing which I fear will make taking the game West quite a daunting task. Not impossible, mind you – it's been done before with Pokemon, after all, what is a Pokemon? Plus I'm sure Level-5 will want to take a game this popular to an international market, but even so, I worry that it won't be the same in English. Overall, I've put in about 8 hours in the game and completed 6 of the game's 11 chapters. The game has a youthful innocence to it that makes it a lot of fun to play. The characters are your basic kid anime tropes, but they serve their purpose, whereas the yokai are playful and charming and easily the game's biggest draw. The creative use of the 3DS touch pad to help in battles is engaging and fun and overall, the game is a solid and well-executed start of a new franchise. While it didn't gain momentum until this year, I can see why Yokai Watch has become the phenomenon that it has, forcing parents to run around frantically searching for the tie-in merchandise to get their kids. Yokai Watch is currently out on the 3DS in Japan. No word on an international release, and God help the translator who has to localize it, but Level-5 has registered the trademark, so there is hope. A sequel is scheduled for release in Japan on July 10th in the form of 2 games, each with their own unique yokai, because the Pokemon model of marketing made oodles of money, and who doesn't love money?